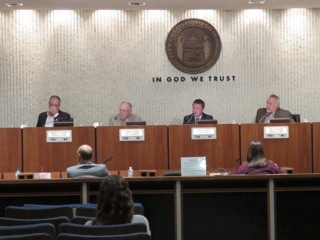 The Costa Mesa City Council will meet again on Tuesday, June 7, 2016 in City Council Chambers beginning at 5:45 p.m. for its regularly scheduled meeting. You can read the agenda HERE. 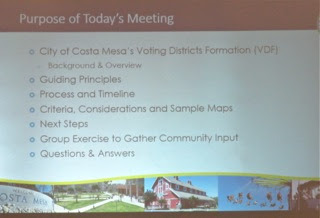 There are two items on the Close Session agenda that will precede this meeting, one of which deals with labor negotiations with the Costa Mesa City Employee Association (CMCEA). There will be a presentation of the Mayor's Award to Kirk McIntosh for the Daily Pilot Cup youth soccer tournament. Following the Public Comments segment, the Council Members reports and the CEO report the Consent Calendar will be considered. 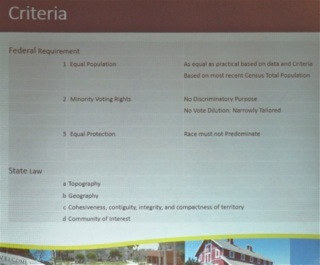 These items, as you know, are considered "routine" and therefore will be considered in one vote unless someone pulls one for separate discussion. If that's the case it will be trailed to the very end of the meeting, forcing folks to stay to the bitter end. Here's a quick review of some of the fourteen (14) items on the Consent Calendar. Item #2, Warrant 2558, HERE, gives us details about the disbursement of more than $3 million of our tax dollars. Click on that link and scroll down to see how your money was spent. Lots of consultants. Lots of temporary employees to back fill the horrendous number of vacancies. Item #11, HERE, are resolutions dealing with the technicalities of managing the municipal election on November 8, 2016. Item #14, HERE, is interesting. 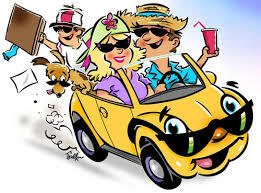 This is a request to cancel the regular City Council meeting of August 16, 2016 and PERMANENTLY cancel the 2nd regular meeting of August each year to accommodate vacations of city staff. BIA REAUTHORIZATION... WHERE DOES THE MONEY GO? New Business #1, HERE, should be interesting. This is the appointment of a new Parks and Recreation Commissioner to replace Don Harper, who resigned earlier this year. The term expires early next year, so this will be a short appointment. There are a dozen applicants - you can read all their applications HERE. 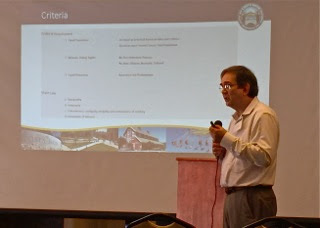 As you scroll down the list of applicants a few familiar names jump out at you - folks who have participated on other committees and have been active in the community for years. And others, with names not so familiar, certainly seem to have strong credentials to give them consideration for the position. And then there are a couple others. 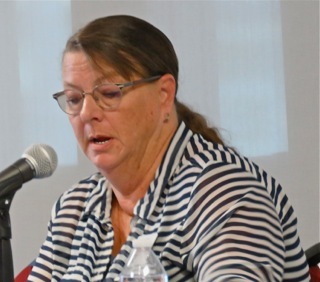 First there is Krissie Bogner, who has a long resume outlining precisely nothing that qualifies her for the position except that she was responsible for making Wilson Park unusable to most residents because she's responsible for the restrooms being locked up. However, I fully expect the least qualified person - Julie Mercurio - to get the job. Her "qualifications" read thus: "I would like to get more involved in the city. I have two children and am dedicated to preserving our open space. Thank you." That's it! No strong academic credentials like many of the others. 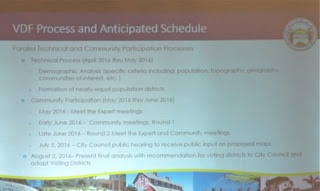 No long history of community volunteer work or other committee participation. She has only two "qualifications" that I know about. She's the heavy-handed moderator of the inaccurately named "Costa Mesa Public Square" Facebook page that pretends to welcome one and all, but doesn't. That site, which offers inducement to folks to sign up and purports to have thousands of members, is the repository of some of the nastiest, most vile and mean-spirited comment threads I have ever seen. And I only see a few because I've been barred from participating, so I depend on friends to provide me with screen grabs of threads. No, her only real "qualification" is that she's a strong supporter of the current power elite and is running for City Council in November. 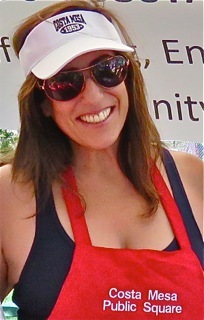 A slot on the Parks & Recreation Commission will give her visibility in the community. Even though there at least a half-dozen highly qualified people who have applied, honestly, I kind of hope she IS appointed, because - even though she would likely be the least competent candidate - her appointment will officially anoint her as a "public official" in a job where her shortcomings will very quickly become evident - and I will just as quickly point them out to you. So, please DO appoint her.. I can hardly wait! 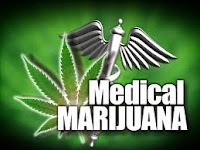 New Business #2, HERE, is the series of actions necessary to place the two competing Medical Marijuana issues that qualified for the ballot last year on the November 8th ballot. 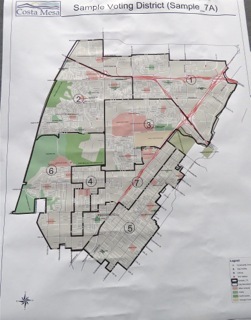 It's my understanding that the City Attorney is working hard to create another city-sponsored measure to compete with these two to be able to adequately managed how those businesses will operate in our city. That's not on this agenda. 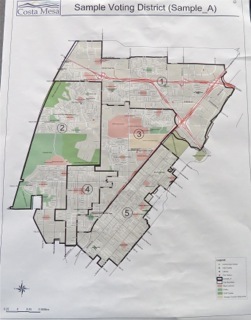 New Business #3, HERE, is a similar set of resolutions to place the so-called Smart Growth Initiative on the November 8th ballot. 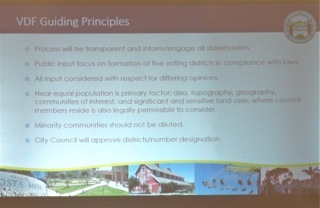 The actual title of the ordinance is, "An Initiative To Require Voter Approval On Certain Development Projects". The City Council has no choice on this one, just as it has no choice on the Medical Marijuana issues - it MUST place them on the ballot so the voters can make a choice. 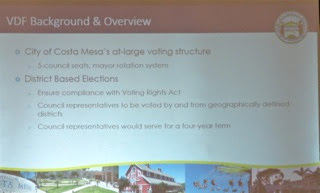 It's my understanding that there is also a competing, city-sponsored, measure being hammered out by the legal department to offer the voters a choice. It seems like an unnecessary expense - they can either vote Yes or No on this one. So, that's it for the agenda. It's my understanding that the Public Comments segment may turn out to be very interesting, and not in a good way. We'll have to see. 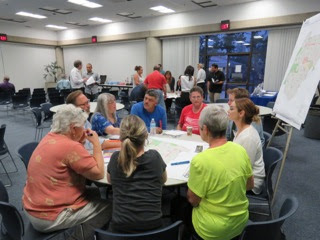 Three dozen of your friends and neighbors - fewer than expected - attended the consultant-led Voter District Formation meeting last night at the Neighborhood Community Center from 7-9 p.m. An identical meeting will be held Saturday, June 4th, at the Halecrest Park, 3107 Killybrooke Lane from 10:00 a.m. - 12:00 noon. This meeting and the one Saturday were not well-publicized. If you missed this first one, plan to make the second one on Saturday. 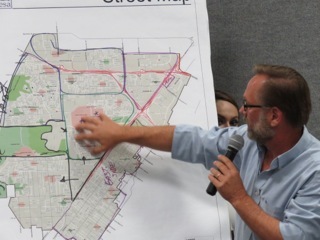 Additionally, there will be a second round of community meetings later this month at St. Joachim's Catholic Church, 1964 Orange Avenue on Wednesday, June 15th from 7-9 p.m. and on Saturday, June 18th at Balearic Community Center, 1975 Balearic Drive from 10:00 a.m. - 12:00 noon. 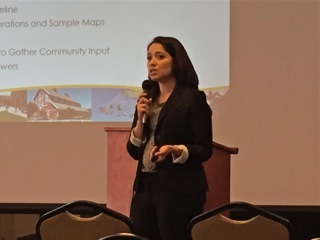 At these two meetings the results of the data gathered at the first two meetings plus the recently-completed series of "Meet The Expert" mini-meetings will be discussed and more public input will be gathered. 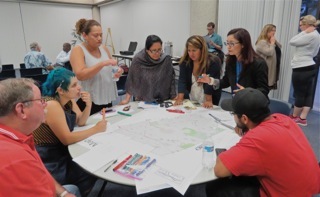 Although Assistant CEO Rick Francis and City Clerk Brenda Green were present, Consultant Yesenia Arias and her team from Arellano Associates and Demographer David Ely (with arms folded in these photos) provided information and displayed four sample maps - three (3) with five (5) disticts and one with seven (7). 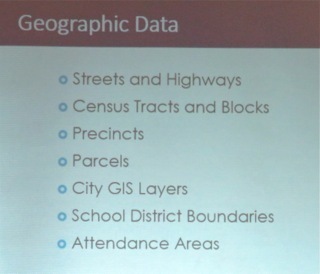 Those were just sample maps to illustrate much of the data Ely had been working with. 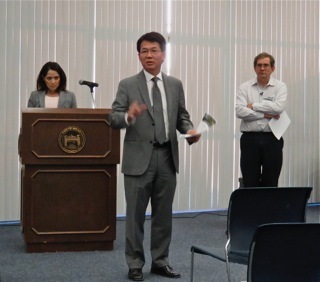 Interpreters for Spanish and Vietnamese speakers were provided. Pay close attention to the slide with the anticipated schedule. There's not much time to complete this process and get the item ready for the November ballot. I think you'll be able to make out the slides he presented. You'll probably notice that section 4 on each is the critical link. That one represents the section with the greatest number of minority (Latino) voters. 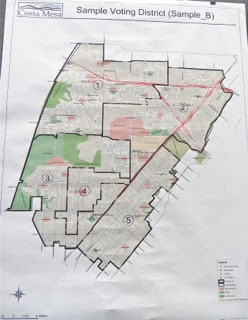 I was especially amused to see how, on Sample B, District 3 completely surrounds District 4. It's an interesting exercise. Click on the image to enlarge. 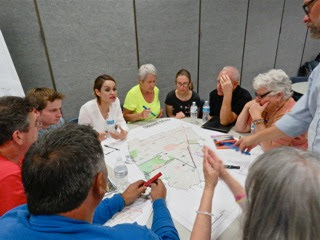 After a break the assembled crowd self-selected into three groups and proceeded to craft their own suggested district maps, using whatever criteria they chose, then explained their reasoning to the rest of the folks in attendance. 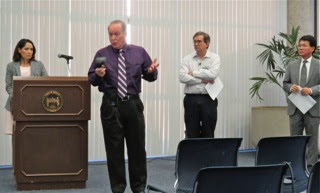 Luke Money from the Daily Pilot and Louis Casiano, Jr. from the Orange County Register attended and will write about the event, too. Look for their stories. I plan to attend the second meeting Saturday, just to see what kind of crowd turns out. A short-handed Costa Mesa Senior Commission (no replacement has been named for departed Stella Adkins and Sue Healey was absent) met before a very small crowd - 8 people eventually showed up to observe and/or speak - in a special meeting this morning with a single item on the agenda - the establishment of goals and objectives, something Commissioner John McGlinn has been pushing for since the very first meeting of this group a year ago. 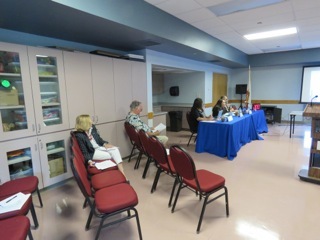 Interim Recreation Manager Justin Martin and Senior Center Program Administrator Yvette Aguilar guided the discussion by providing some history and some statistics, but it was clear early-on that some of the commissioners felt the proposal to craft and adopt the goals and objectives at this meeting was overly-optimistic. 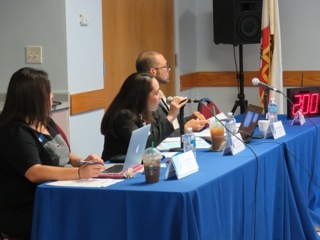 Each commissioner had been asked to come prepared to offer suggestions for goals and objectives for their peers to consider, and each of them did. 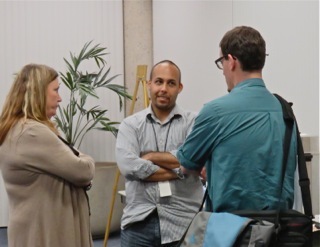 The discussion was more free-form than past meetings - more like a study session - so the conversations many times overlapped, but in a good, constructive way. 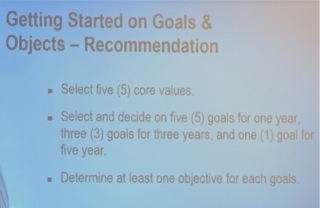 Sometimes it was difficult to tell whether a commissioner was describing a goal or just providing background. In my opinion, this was - by far - the most productive meeting of this group so far. KROCHMAN GOT TO THE CORE... WHO DO THEY SERVE? While each of the commissioners offered good suggestions, the core of the issue this morning revolved around Commissioner Janet Krochman's suggestion that they didn't have enough data to actually accomplish this task - yet. For example, she suggested that they didn't really know who the Senior Center was supposed to be serving. She cited the fact that, based on the numbers currently available, they are trying to design programs and services for a very broad age demographic - ages 50 through 100. 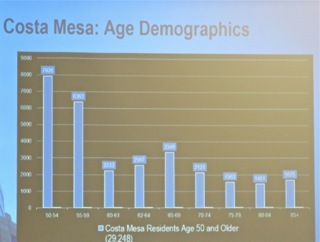 The membership at the Senior Center has dropped by 50% since the initial push last year for free membership. Of those 832 remaining, we don't even know the ages of of 53 (6%) of them. 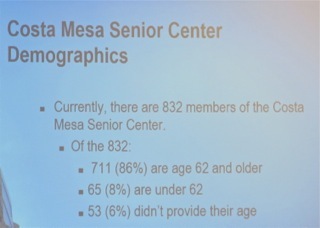 In fact, the Senior Center is currently providing services and programming for only 2.8% of the Costa Mesa seniors - if you begin to count those ages 50 and older. 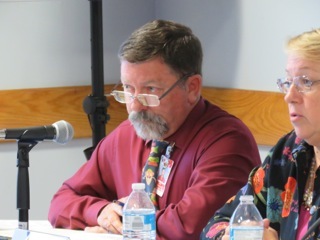 McGlinn at one point observed that it was costing somewhere in the area of $900 per member to provide services - a questionable return on the investment. WHAT ABOUT THE 50-59 GROUP? 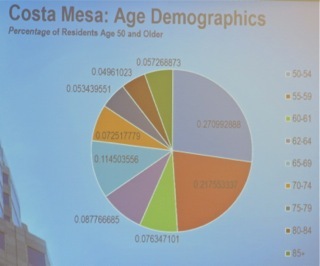 It was generally agreed that it was important to attract more seniors to the center, but some wondered whether there would ever be programming and scheduled hours to attract the largest segment - the 50-59 age group, most of whom are still working and raising families. At one point it was suggested that the definition of "senior" may need to be amended to exclude that particular group. This suggestion was serious, since grant funding depends on providing services to a specific percentage of the group to be served. 1 - Increase the participation of the 55-65 age group. 2 - Expand the hours of operation to accommodate a broader age group. 3 - Explore a different method of access control and use the data collected to further define those being served, and how. There were other suggestions buried in the discussions. 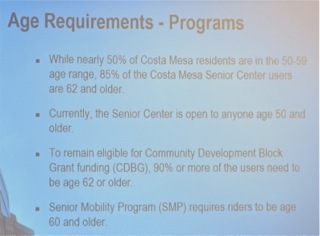 5 - Each Costa Mesa high school sponsor an event at the Senior Center next year. 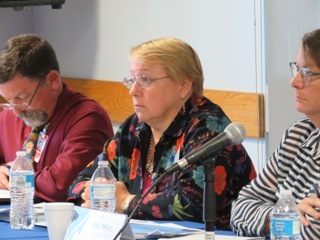 Vice Chair Ann Perry opined that "we're here to serve the seniors, but if some don't need us, that's OK." She observed that those in their 50's don't see themselves as "seniors". She suggested that membership sign up sheets should be included inside every issue of The Chronicle. She suggested greater outreach at venues like the Fish Fry, Concerts in the Park and the Car Show. 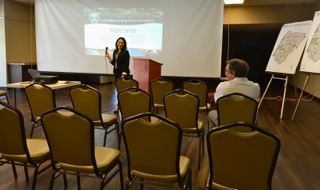 She thought there could be transportation to City Council meetings and that City Staffers could make presentations to the seniors on operations within City government. She also suggested high school groups could do dress rehearsals or abbreviated versions of upcoming productions at the Senior Center. She also suggested more weekend and evening programming be created to serve the younger demographic. 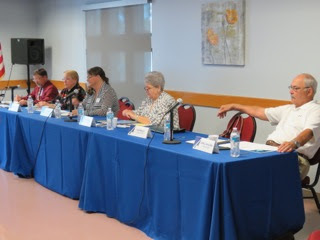 Chair Ernie Feeney suggested that it would do little good to attract more seniors to the center if we were unable to provide transportation, so she suggested a goal of adding another bus and driver to facilitate better transport. She further suggested expanding special programming from Friday nights to other evenings of the week. 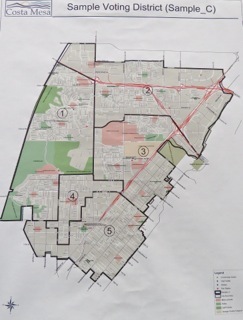 She suggested mailing The Chronicle to the mailing list of the city Recreation Guide twice a year, to expand the readership and potential membership. She also mentioned a "volunteer greeter", but it was unclear if that was to be considered a goal or not. 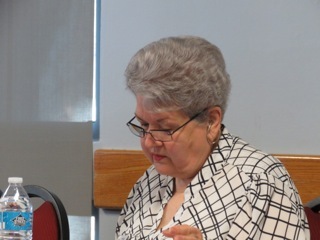 She also suggested an annual survey of all attendees to the Senior Center, using simple "yes or no" questions. 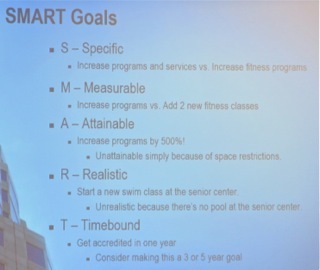 Krochman wondered if the programming outlined in the Recreation Guide may overlap some of the Senior programming. During Public Comments two people rose to address this issue. 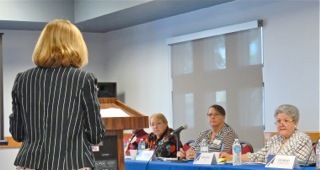 Long time activist and volunteer Charlene Ashendorf suggested, using her own, personal experience, that we shouldn't leave the 50-59 group behind - that they can be valuable assets to the center and learn from the more senior members. She opined that we need to remain relevant in this digital age and the Senior Center should be a one-stop destination for many services. 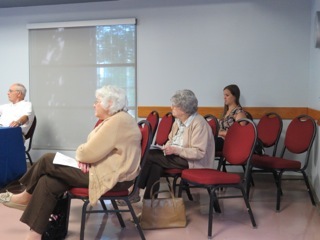 She suggested that we need to "cultivate the Senior Center" and adhere to the core values. 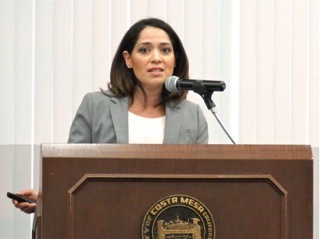 She also indicated that The Friends Of The Center could be a valuable resource. 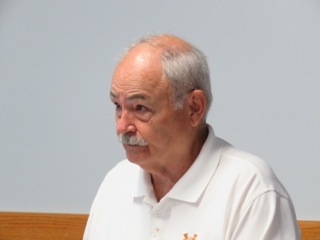 Former councilman and current candidate Jay Humphrey thanked the commissioners for serving, then observed that the two minutes alloted per person for speaking with such a small group was "preposterous". He observed that the commission didn't seem to have enough information to make proper decisions yet. He also suggested folks who declined to return be polled to find out why. 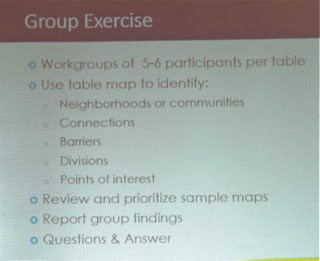 He also suggested a series of "invite a friend" events, where members would be asked to bring a non-member as a method to expand membership. 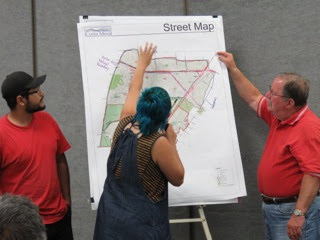 The information discussed will be compiled by the staff and presented to the commission, along with answers to their many questions, at their July 12 meeting where this process will continue and - with luck - goals and objectives will be established.